Aquolina has launched Pink Flower by Pink Sugar, a new floral chypre gourmand fragrance for women. 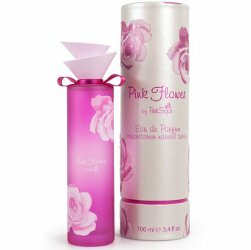 Pink Flower is geared slightly older than the brand's popular 2003 Pink Sugar fragrance. The notes include raspberry, mandarin, black pepper, jasmine, rose, white flowers, patchouli and vanilla. Pink Flower by Pink Sugar is available in 100 ml Eau de Parfum and in matching body products.